For our grand finale in Hawaii, we went the tourist route and signed up for a kayak/hike trip to (not-a-secret) Secret Falls. 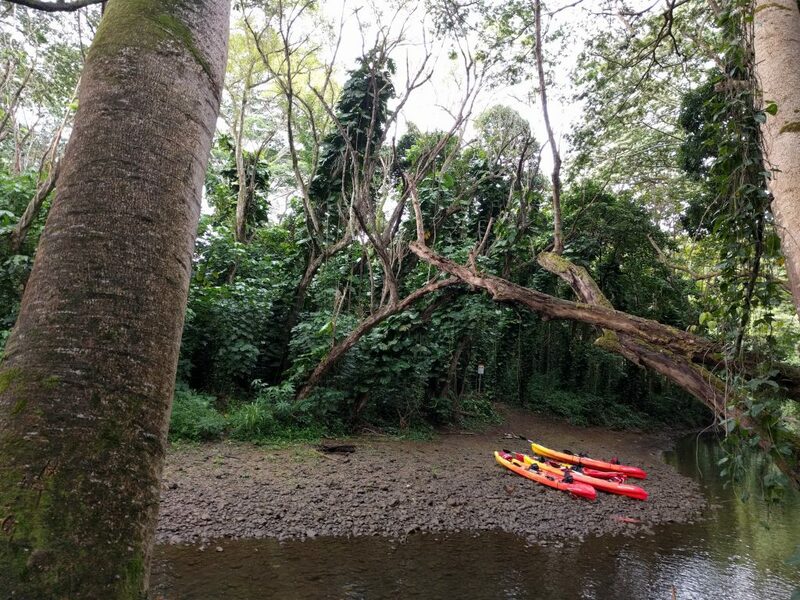 The tour included a casual kayak up the Wailua river to a take-out point, which served as the trailhead for the hike. Hike to the waterfall, hang out and swim, then hike back and kayak out. Seemed like a lovely way to end our trip. We signed up for the earliest departure we could and met our guides at the shop. Aaron and I were outfitted for a double kayak. We put our stuff in the dry bags, got on the sit-atop boat and prepared to paddle off. There were a few other boats in our group, as well. Kayaking on the calm river was fun and relaxing. I don’t get on the water nearly as much as I’d like to and since I own no watercraft, it’s not convenient. I appreciated the chance to have someone else deal with the gear and the logistics so I could just enjoy the ride. Aaron and I got into a routine, paddling together, taking plenty of rest breaks to soak up the scenery. It was gorgeous. Tropical plants lined the river bank. Although the sky was gray and the air cool, it still felt like floating through paradise. As we got closer to our take-out, the river narrowed. Trees and shrubs draped over the edge of the water, crowding us into a thin stream of water. We ducked and weaved as we made our way to the shoreline. It almost felt like we were having a real adventure! Then we saw all the other boats pull up next to ours. Oh yeah, guided tour. Super popular place. Check. On shore we prepared for the walk to the falls. The trail was atrociously muddy, as expected. I was prepared with my Tevas today. I figured the guides would give me a hard time about being barefoot. We hiked in through a tropical jungle to a tall cascade of water falling into a perfect swimming hole. And we were the first ones there! I knew the solitude wouldn’t last, so we quickly got into our swimsuits and hopped in the water. We swam, we frolicked, we went behind the splashing waterfall, we took it all in. Yes, this is what people dream of doing in Hawaii. Back on shore we toweled off and partook in the snacks that were brought for us. I got distracted by watching several roosters hopping around on the rocks downstream. It was still funny to see roosters in the jungle. When our time was up, we packed up to return to the kayaks. Several other groups had hiked out by now and we passed even more people on the way in. At the river, there were a ton of boats parked on the shore. What a mad house! We loaded up and headed back to the dock. Merely feet away from the dock, a family with two little kids on our tour flipped their boat and all of them went crashing into the water. The kids were crying, the dad dropped his phone to the bottom of the river and the peace was broken. I don’t know how exactly one flips a sit-atop kayak but I suppose having two little ones on board could be challenging. After all the drama died down we got in the van to head back to the shop and to be on our merry way. I’m glad we went the tourist route at least once to be able to experience the island in a different way. It’s been an incredible trip for a number of reasons and I’m glad we went. I’m also glad to be headed back to Oregon to move into our new home and experience life on the dry side of the mountains! 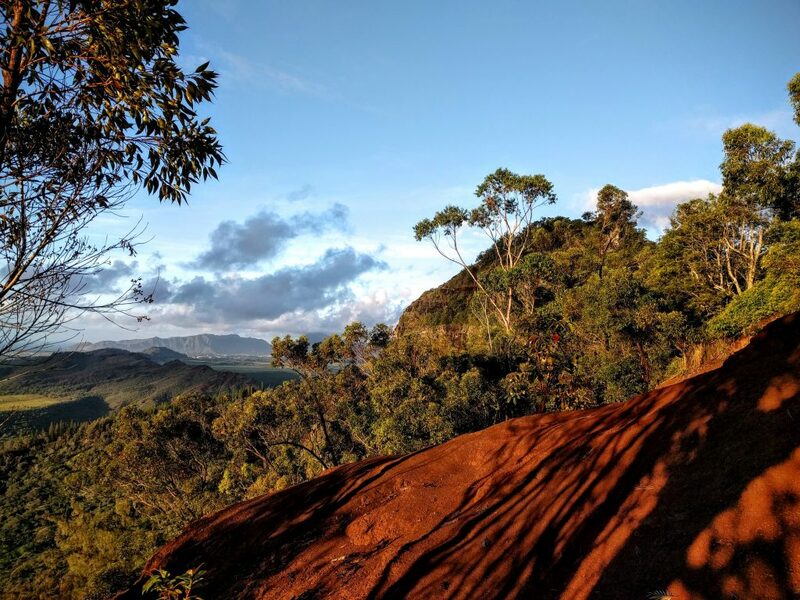 This entry was posted in Hawaii, Hiking and tagged hike366 on September 19, 2016 by Jess B. 6.6 mi | 1600′ ele. gain | 4:15 hr. 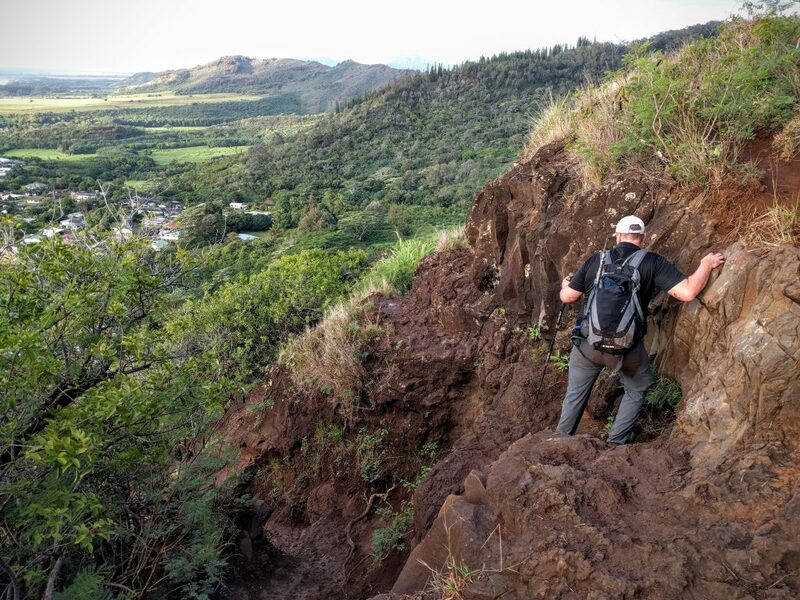 Today we headed back to Koke’e State Park to check out another viewpoint hike. The weather was crap and the trail was muddy right at the trailhead. I was so done with this wet weather. We could have stayed home for rain. We packed up our rain gear and set off on the hike. When I wasn’t busy whining about the damp and mud, I paused to appreciate the diversity of native plant life here. The forest was alive with a wide spectrum of colors, textures, shapes and sizes. There was the ever-present and always delightful ‘Ohi’a lehua, which reminded me of rambutan. Beyond that I couldn’t tell, there was so much to learn about the plants growing here. I came across some familiar-looking plant life that greatly resembled paintbrush and thimbleberry, both common in Oregon. Were they related? I couldn’t be sure. It would be interesting to take a walk with a botanist today. 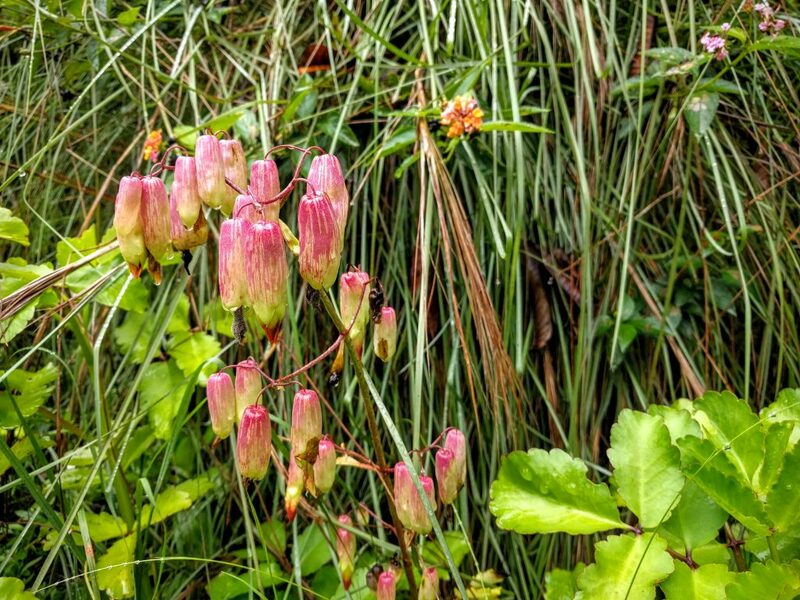 My favorite plant was the one that had little lantern-shaped pods drooping from thin stalks. As we approached the end of the trail, the trees gave way to meadows and suddenly we found ourselves at a railing. “Warning: Hazardous cliff!” it exclaimed. And I’m glad it did, since we couldn’t see more than ten feet in front of us. We were enveloped in a cloud of fog. Ugh, so this is how it was going to be. A soggy mud hike to a viewpoint with no view. I was a little grumpy. We sat down and ate some food, hoping the cloud would lift momentarily. It never did, but we were entertained by a forest rooster and a red-crested cardinal (which is actually a tanager, not a cardinal). They were jovial enough and provided us something to look at instead of the dramatic ocean views we were hoping for. We walked back in the rain, debating whether it was better to wear rain jackets or not: keep the outside rain off and drip from the inside? Or let our sweat evaporate and get replaced by rain? It was a fierce debate. 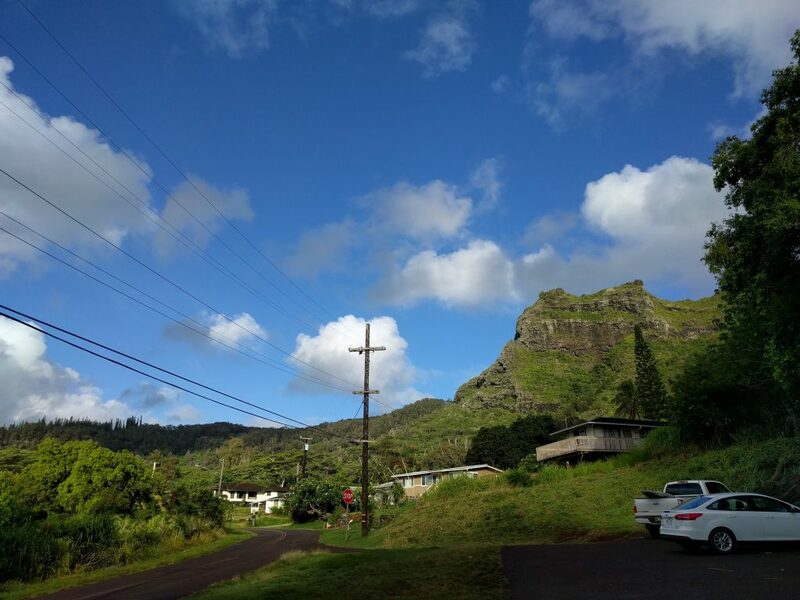 This entry was posted in Hawaii, Hiking and tagged hike366 on September 17, 2016 by Jess B. We met up with our friend Milt for this classic hike on Kauai’s northern coast. The Kalalau Trail is the one trail on Kauai that everyone talks about. Quite possibly the only trail in Hawaii that everyone knows. So, we left early in order to get a parking spot and avoid the worst of the mobs. Much of the Kalalau Trail is reserved for permitted backpackers only. Day hikers are allowed to go a couple miles up the trail and turn inland for another 2 miles to access Hanakapi’ai Falls. That was our plan. My knee was feeling a little rusty so I packed my knee brace for this hike. I wasn’t sure how treacherous it would actually be. Based on my research I knew it would be muddy with some steep sections. We were nearing the end of my trip and I wanted to leave with intact body parts! We began hiking around 7:30 am. There were already people in the parking area but it was mostly empty. It was nice to have Milt along, another person to talk to. Aaron and I had been together every second for the last couple weeks and while that was awesome, it was also great to shake things up. Right from the get-go, the trail was rocky and wet. Rain clouds loomed across the sky. We got a few sneak peeks at the ocean from viewpoints along the trail. Mostly though we walked through thick vegetation. After an hour of walking we arrived at the trail junction to the waterfall. Here, the Hanakapi’ai River flowed into the ocean. An interpretive sign warned of flash flood possibilities. Although it was a bit rainy there wasn’t much danger of flooding today. We turned onto the falls trail and started rock-hopping again. Then, the trail criss-crossed the creeks leading into the river and the river itself, many times. The trail just kept getting muddier and muddier. I’d decided to take my shoes off long ago and finish the hike barefoot. When we finally arrived at the waterfall we enjoyed the mostly crowd-free sight. But, coming from the land of waterfalls (Oregon) I must say I was only mildly impressed. 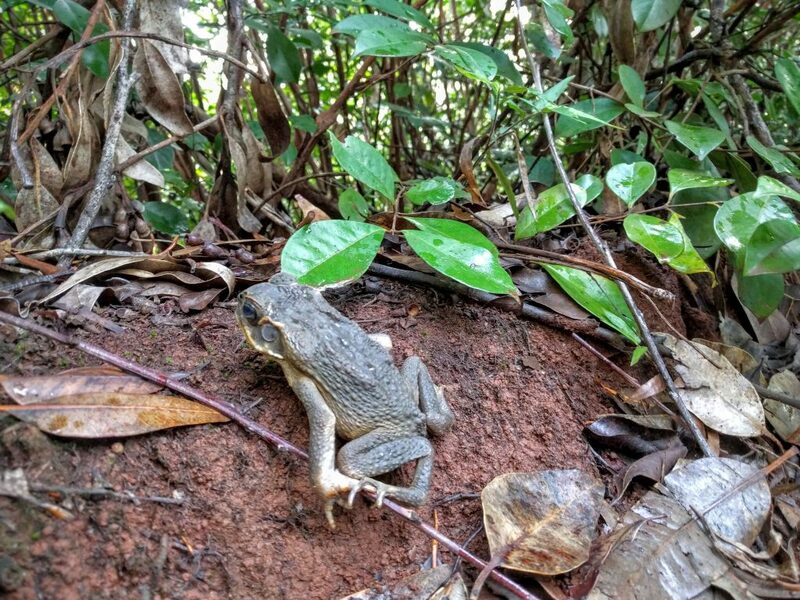 The hike through the jungle was way more interesting than the point of interest in front of me. But, no matter, we enjoyed the view, had a snack and headed back. Now the masses were coming in. We had to stop many times to let people through as we tried to negotiate the narrow, slippery trail. By the time we returned to the parking lot it was a full-on circus. I couldn’t believe how many cars there were! Holy cow! 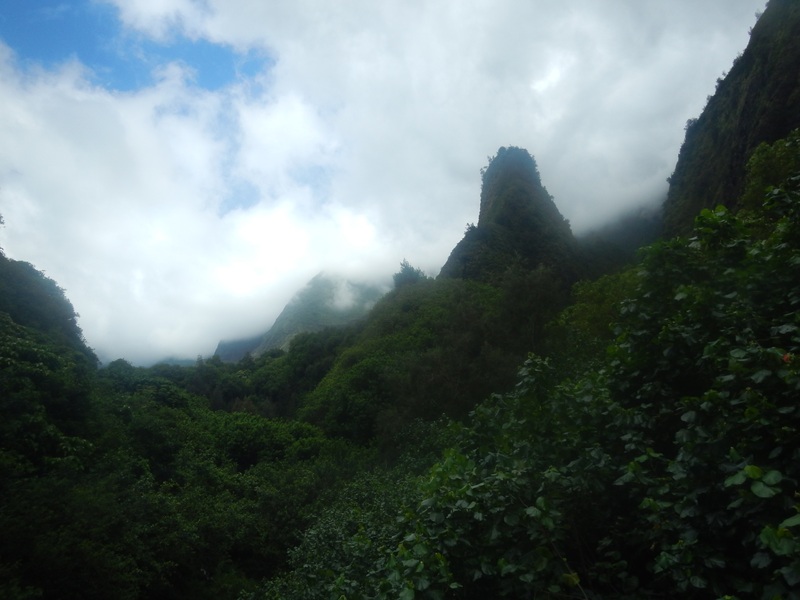 What I learned about Kauai is that this is a place that people come in order to go hiking. So, the trails are packed. 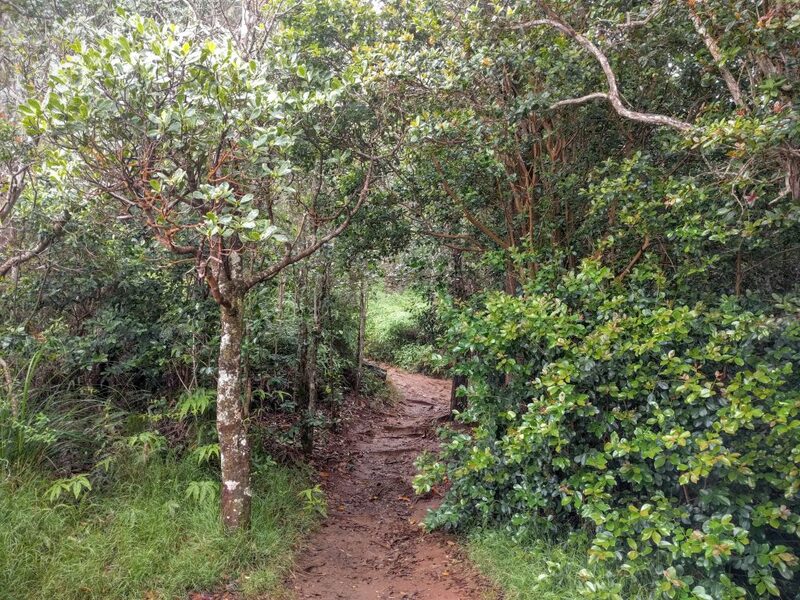 People don’t go to Maui to hike, so the trails are much less crowded. This “hiker’s paradise” was starting to feel much less like paradise and much more like a tourist trap. Nevertheless, we enjoyed our walk and I’m grateful for two hiking partners who didn’t mind the early wake-up call! 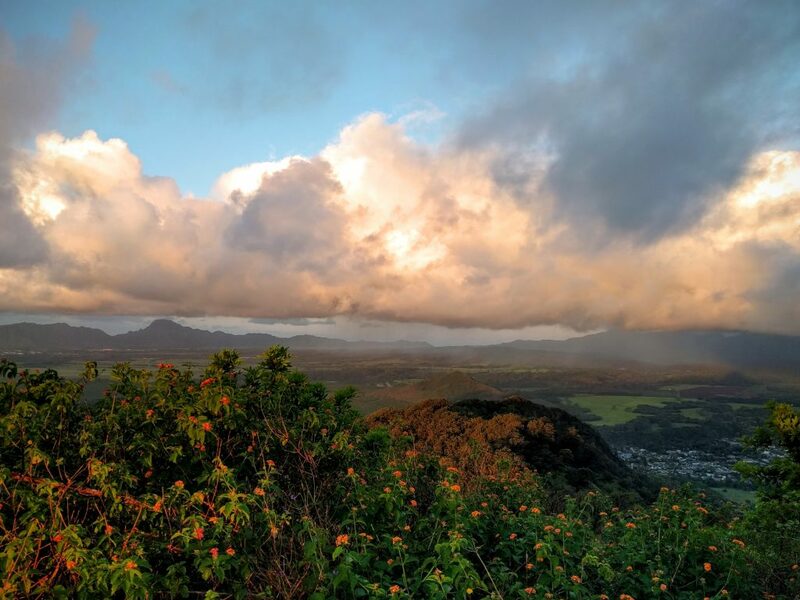 This entry was posted in Hawaii, Hiking and tagged hike366 on September 16, 2016 by Jess B.
I got the grand idea of watching the sunrise from the Sleeping Giant, a popular mountain close to town. We, of course, got up silly early in order to do this. Quite the opposite of how most people choose to do vacation. We strapped on our headlamps and prepared to hike up the pitch dark trail. It was only 2 miles long but it gained a thousand vertical feet in that distance. It was going to be a little bit of a lung-buster. We started walking, single file, up the slick and muddy trail. I flashed my headlamp down for a second and caught…eyes. EYES. Unmoving eyes. And again! The trail was packed with bullfrogs. It was completely insane. They sat staunchly in their position, completely unimpressed with us being there. I thought for sure I’d either step on one or impale one on my pole. Yikes. We carefully chose our steps all the way up the mountain. In sections the trail was very difficult to follow. The tread had all but washed away from the incessant rains. We made our way through the worst of it, made even more sporting in low light, and eventually came to the top of the trail. It was at an arbitrary point, seemingly, with several options for exploring ridges and highpoints beyond. We heard voices of other people looking to capture some sunrise photos too, and all I wanted was our own little spot. We found it, and just in time for a quick rainstorm to pass over us. Glad I had my rain jacket ready to go! Despite the frogs, mud, rain and other people it was an absolutely spectacular sunrise. Watching the colors change as the sun came up over the water was breathtaking. We took lots of pictures and tried to soak in the scene. Yes, we were in paradise. The hike down was far more interesting than the hike up because we could actually see! There were beautiful trees and flowers all around us. There were even a few remaining daytime bullfrogs. Every leaf dripped with water, keeping the ground moist. The colors seemed over-saturated, except this was real life. It was interesting to see the eroded trail in full daylight. Eek! Surprising that so many people make the trek up here despite the awful trail conditions. I guess since there are two alternate routes up that most people go a different way. We stopped and stopped and stopped to take photos all the way down. What a glorious place. Paradise, indeed. In no time at all we returned to the parking area, ready for breakfast! 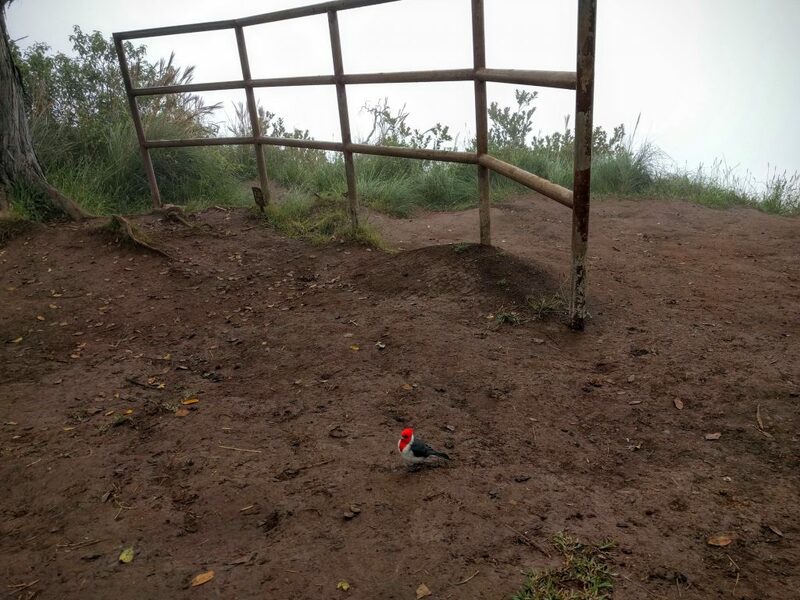 This entry was posted in Hawaii, Hiking and tagged hike366 on September 15, 2016 by Jess B. We arrived in Kauai yesterday, with enough time to get settled in to our new place. We visited a couple of over-run tourist viewpoints, did some grocery shopping, and took the stand-up paddleboards for a test spin. All in all, a pretty mellow first day. Now it was time to hit the trails. Our first destination was clear across the island, up the Waimea Canyon. 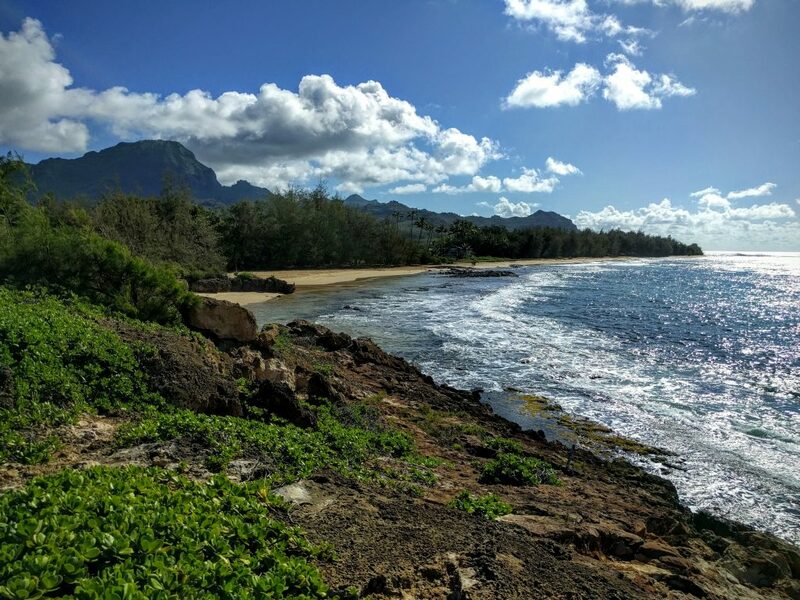 This is one of the places everyone talks about visiting when you mention you’re traveling to Kauai. This island is for hikers, everyone had told me before our trip, so we were going to love it here. On the long, winding drive up the canyon, we pulled off at a sign for the Iliau Nature Loop. 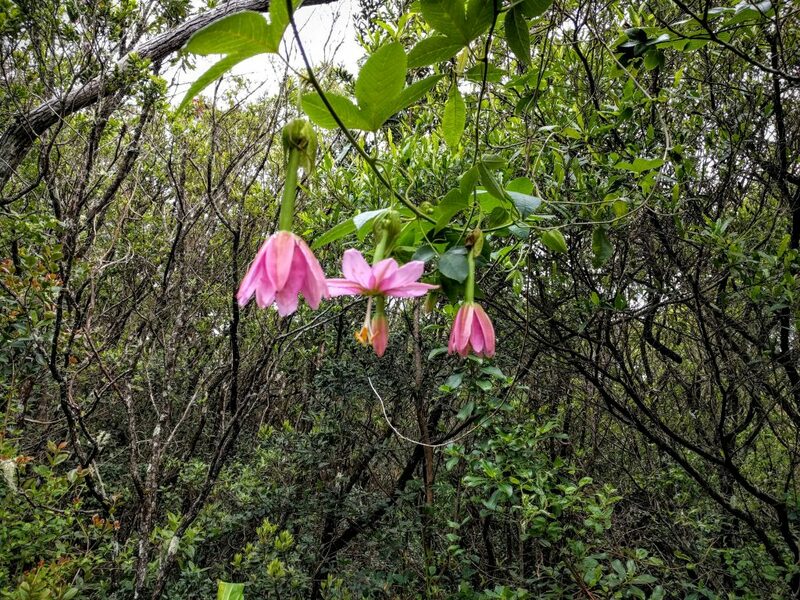 This quarter-mile loop was a treasure trove of beautiful, native Hawaiian plants. We found interpretive signs near many of the unusual plants that described their human uses and unique characteristics. 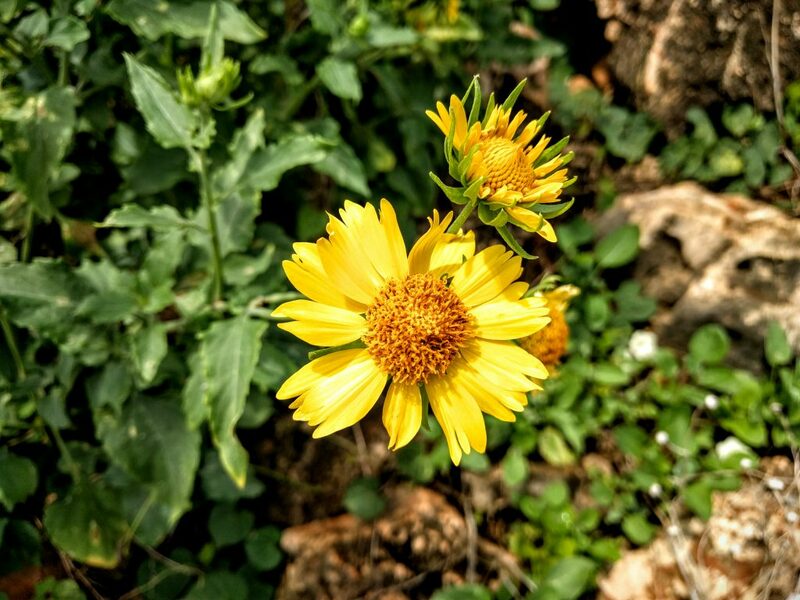 Some of the native plants included: ? ?hi?a lehua, koa, p?kiawe and of course, iliau. The iliau, found only on Kauai, is a relative of the silversword we saw at Haleakala Crater. Ihe shapes, colors and textures of the flowers and leaves captivated my imagination. It felt like walking through a Dr. Seuss book. Quite possibly one of the biggest bang-for-your-buck 0.25 mile hike there was. We continued up the road and stopped at the park store, which was just opening up. There we bought a trail map and talked about hiking options with the store clerk. Quickly we got back on the road to drive all the way to its end. The trailhead, and a popular viewpoint overlook, was at the end of the road. There were many people standing around taking pictures of the gorgeous Kalalau Valley. We took it all in, then walked down the trail. Today was pretty dry. The trail, which was heavily traveled and rutted, appeared to be made mostly of dried mud. I couldn’t imagine how hellish it would be when wet. The trail descended steeply along the edge of a cliff, with periodic views of the coastline. We turned on a trail to Pihea Peak, which was pretty heavily treed. There was a summit marker there, but not much of a summit. Back on the main trail, we hiked on a dilapidated boardwalk all the way to the end of the line. The boardwalk was a bit treacherous in sections because the metal grate overlying the boards was broken and sticking up. It would have been easy to get stuck with the sharp wire in your foot or lower leg. We proceeded with caution. On a clear day, this may well be an excellent viewpoint. But today we stared at the inside of a cloud. It was still a nice place to sit and take a snack break before following the boardwalk back to civilization. As we walked back I enjoyed the various vegetative curiosities along the way. The ferns, trees, lichens, wildflowers and items of undetermined genera. This was really a special place. We knew we were getting close when the throngs of people thickened. Out in the swamp we didn’t come across too many other hikers. But now, oh yes, the people have sprawled beyond the roadside viewing area. I took my shoes off to slosh up the final, muddy trail segment. The mud squished between my toes. 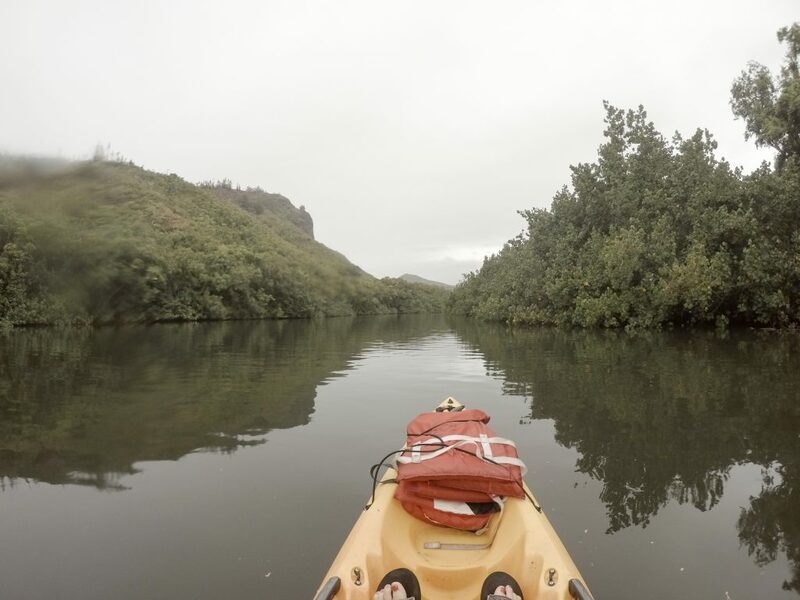 It felt like a long day on the trail, and our Kauai adventures had only just begun. 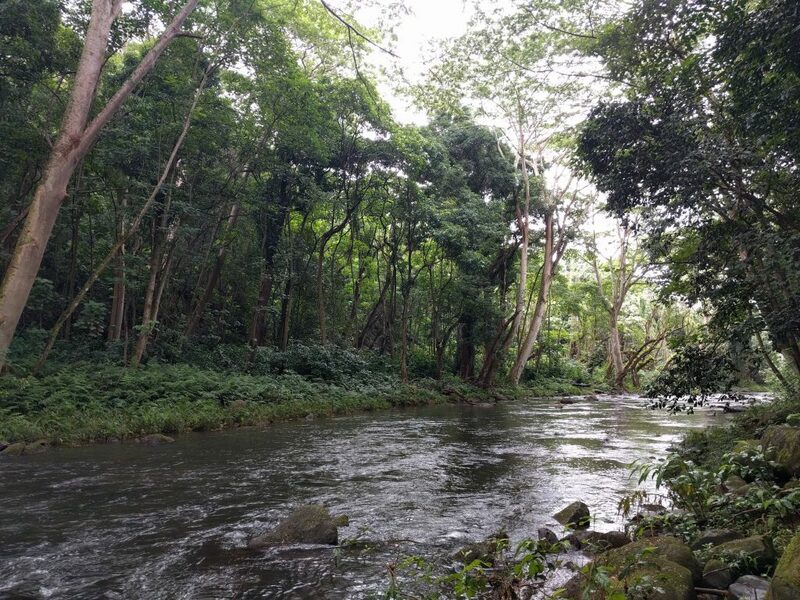 This entry was posted in Hawaii, Hiking and tagged hike366 on August 24, 2016 by Jess B. Another beautiful day on Maui, another beautiful hike. There aren’t a ton of hiking trails on Maui, so it was important to get an early start. That we did on this lovely Thursday morning. We arrived at the parking lot early enough, after getting turned around on a few confusing roads and getting stuck in school traffic. There were just a handful of cars in the lot when we parked. The trail began as a concrete road just behind a cattle gate and immediately launched up a steep hill. That got us warmed up right away. Shortly we passed into the forest. The trail became wide, muddy, and overrun with roots. We were covered, thankfully, by a broad canopy of leaves that shielded us from the hot sun. The trail climbed and climbed up to the ridge, with occasional views extending out across the nearby valleys and peaks. We were lucky to catch some incredible glimpses of the fluted ridgelines to the south. A few sections of trail clung to a narrow band of earth that was guarded by very thick shrubs on either side. 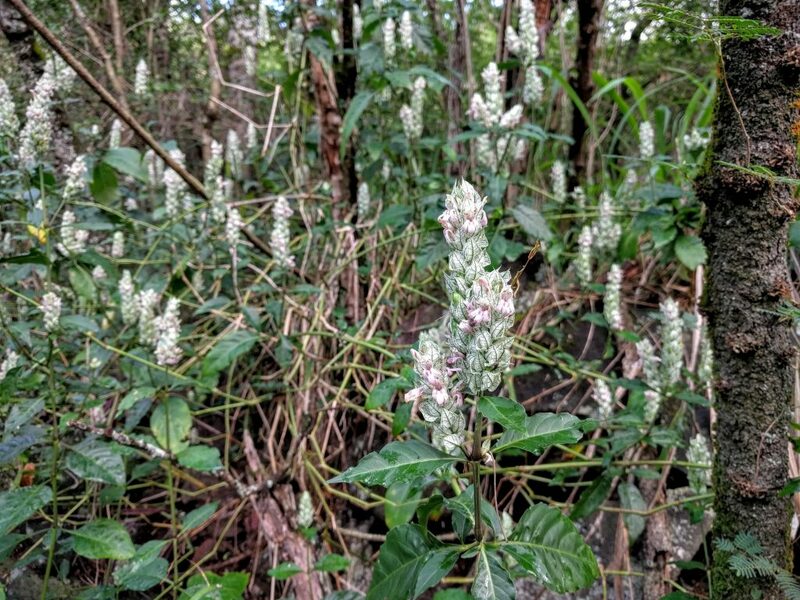 These plants were clearly well-adapted to the challenges of living in this climate. The trail became more and more mucky and slippery as we ascended. The sky, which had been cooperating thus far, began to surround us with clouds. We pushed our way up hill, working hard to breathe in the thick, moist air. As we approached the summit, the visibility was very poor. 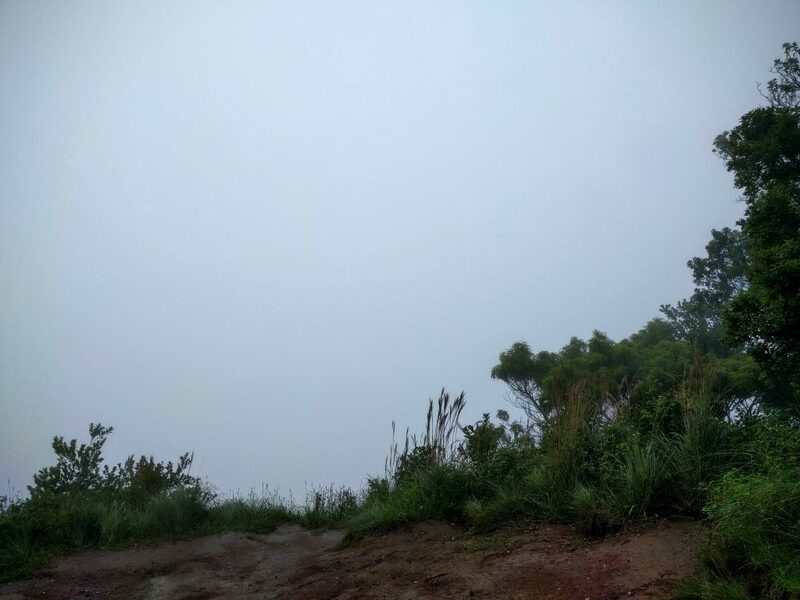 At the top, all we saw was a picnic table, a couple other people, and a thick bank of clouds. The spiders making webs on the ridgetop plants became the highlight of the summit area. We hung around a bit, in case the clouds miraculously parted, but we became more impatient as we waited. More and more people filed up the trail to rest at the summit. And we decided to head back down. Suddenly it felt more muddy than before, and we were glad to have our hiking poles with us. It was absolutely incredible to see the massive amounts of people on their way up the trail. One group after another marched along, having loud conversations and slipping and sliding their way through the mud. No wonder this trail looked like a disaster. Near the bottom, there appeared to be a large school group doing some sort of project. I was sure glad to be done with it. After the hike, we visited quite possibly the worst and most poorly managed park I’d ever been to, ‘Iao Valley State Park. Fortheloveofgod, skip this park if you ever go to Maui. There’s no real hiking, the few trails are run down, it’s insanely crowded, the bathrooms have been out of order forever, and they charge you $5 for parking even if there’s NOWHERE to park and you have to drive like a vulture waiting for a car to leave. Google the photos online and save your sanity by visiting this park virtually. Lucky for us, we made an excellent choice for our next stop, Ho’okipa State Park. 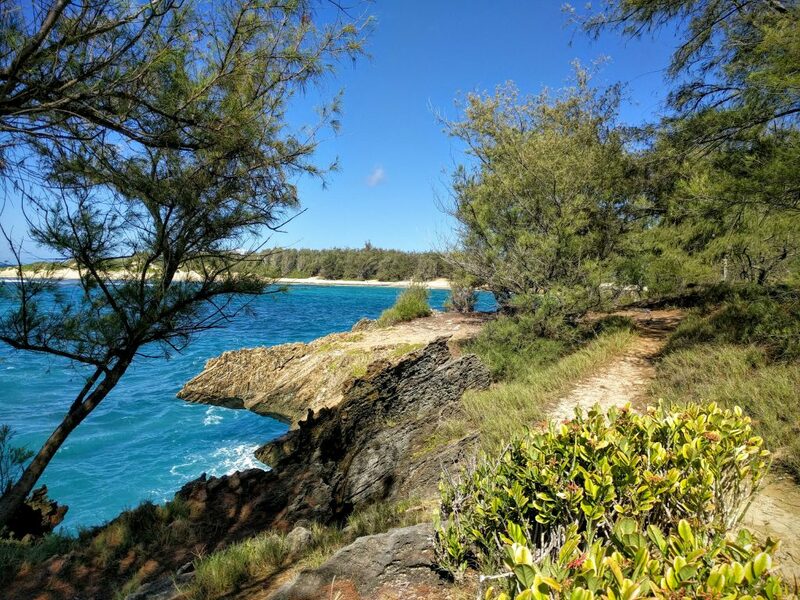 This beachside recreation area had grassy, shaded sitting areas, a beautiful beach, several food carts to choose from, and a series of incredible tidepools. Oh, and plenty of free parking! We got some lunch from one of the food carts and lounged in the shade as we listened to the soothing sounds of the ocean. We wandered through the tidepools, where we discovered some really cool intertidal sea creatures, and curious sea turtles bobbing around in the water. Today was one of the slower-paced days of our visit (after the hike was over!) as we were saving up our energy for a snorkeling adventure tomorrow. 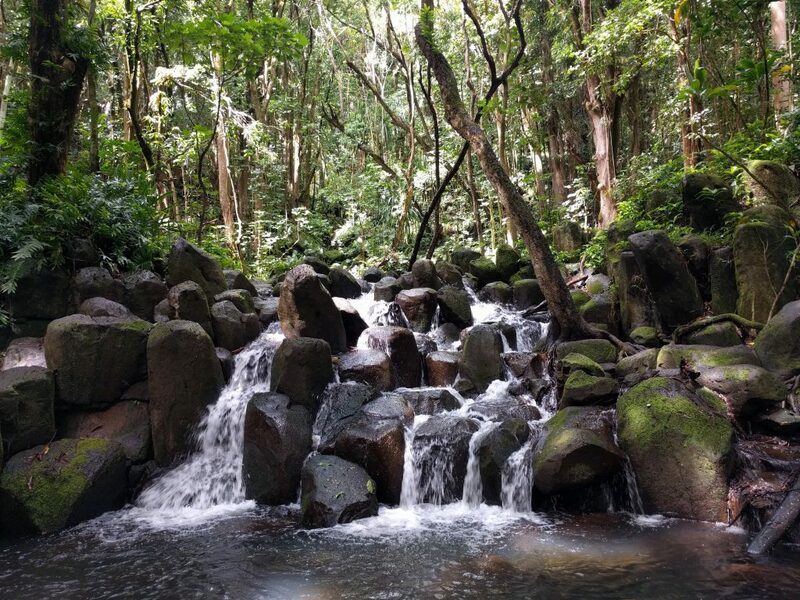 This entry was posted in Hawaii, Hiking on August 23, 2016 by Jess B. We came, we surfed, we ate shave ice, and we traversed an acid war zone. But that’s not all! Blowholes, banyan trees, dragon’s teeth, and much more awaits the curious visitor on Maui’s western shores. By now we were getting settled in on Maui. Most of our time had been spent in the upcountry, however, and we were ready for the beach. We got up early to head to Lahaina for our very first surf lesson. Not having planned ahead, we showed up at a surf school to try and get a same-day lesson. But the first place we stopped into turned us down, so we walked across the street to Banyan Tree Park where Aaron started making phone calls to other shops nearby. I wandered beneath the gigantic Banyan. Native to India, this tree was brought to Maui over 150 years ago as a gift. It was planted, nurtured, sculpted into a symmetrical shape, and now covers nearly an acre of parkland with its enormous canopy. Prop roots dangling from the branches were encouraged to root into the ground in order to create satellite trunks. These new trunks enabled the tree to keep growing wider and wider, providing a nice, shady respite from the Hawaii sun. Meanwhile, Aaron scored us a surf lesson from the Goofy Foot Surf School and we were off to our next adventure. We met our instructor, Armadillo, a stereotypical-looking surf bum. After the rest of our group arrived we headed to the beach for an introduction to surfing. He taught us how to stand, how not to stand, how to turn, where to put our arms, etc., all while safely grounded on the beach. After that we paddled out into the water where we followed him out to the surf one person at a time. I had to leave my glasses behind so I was going blind from here on out. Amazingly, we each got up on our first wave, excited that the abusive lesson we’d just endured actually sunk in. We went on to have varying success on several more waves in the next couple hours. They were pretty small and predictable, but it was pretty exciting to be standing on top of the water. After that we were ready for a snack. We stopped at a shave ice stand so Aaron could see what all the fuss was about. I had fond memories of shave from the last time I was in Hawaii. We both enjoyed our treat, one of many, many more that we’d have on this trip. We putzed around for the rest of the morning and early afternoon, trying to escape the wind and rain showers. Around 3 pm we pulled up to the parking area for the Dragon’s Teeth. Our guidebook described a short walk alongside a golf course that led to an unusual rock formation at the ocean’s edge. 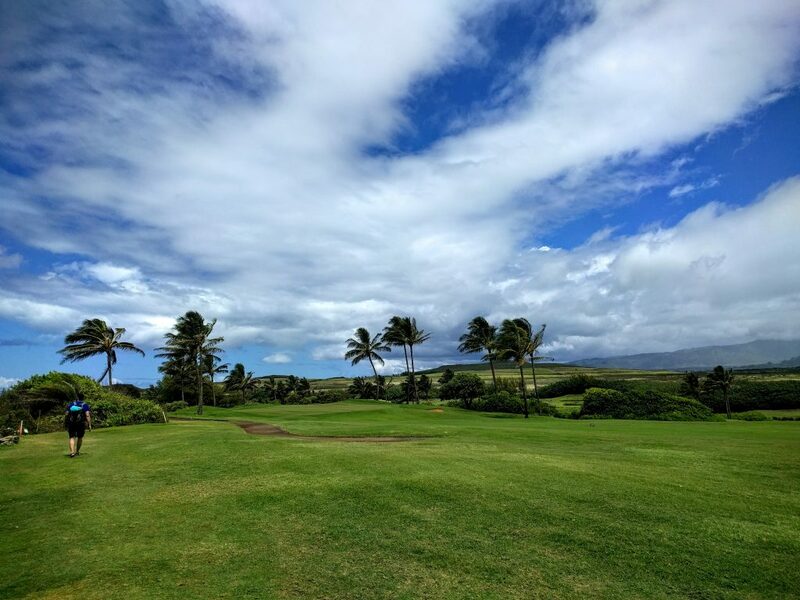 It took us a few minutes of walking around, asking “is this it?” before we literally walked single file along a thin dirt track sandwiched in between a golf green and an ancient Hawaiian burial site. It was weird. But soon we saw the formation and knew we were in the right place. Tall fins of solid lava rose up from the cliff edge like waves frozen in time. The gray clouds above us and the gray rock beneath our feet created an eerie mood about the place. Succulent plants provided an occasional burst of color within the black and white scene. But there was one more geological oddity we needed to see today so we hustled back to hop in the car and continue north along the coastal highway. We drove through a couple tiny towns, eyes on the windy road, not stopping until we got to a parking area for the Nakalele Blowhole. The book described a few ways to get there, but we wanted to take the “Acid War Zone” hike to the blowhole. So we pulled into what we thought was the right spot. The blowhole is, of course, marked on Google Maps (isn’t everything?) so we knew we were in the right neck of the woods. There was no sign, and no trail. but some vague directions to cross the brushy shoreline to a lighthouse and then walk cross-country through the rocky “war zone” until we happened upon the blowhole. Hooray for another adventure! We found our way through the sand, shrubs, and trees to a man-made structure that resembled some sort of light beacon. There was a parking area there, with a truck there, so I guess we could have started further up the road. Regardless, we found a little path through the rock that was marked with white blazes (are we on the Appalachian trail, I thought?). Down we went through the rock. It was, in fact, carved up as if the rock had gone through an acid bath. The pock-marked black lava rock was ruggedly beautiful. It started to rain. We were mostly prepared for that. We pulled out our rain shells and zipped up our phones in their protective cases. We encountered one guy heading towards us who confirmed we were heading the right way. After cresting over a couple of rock piles we found our blowhole. It was just what you would expect, a hole in the rock where a column of water bursts through with each incoming wave. Standing in the rain, it didn’t feel all that impressive. But we enjoyed the meandering walk along the rocks. I wonder now, that I’m back at home, if we found the right one or if it was one of the distractions along the way to the real thing. Not sure that it matters at this point. Heading back we were on a serious mission to the car. We were getting chilly, Aaron’s sandals were failing and the rain was pouring down harder now. It was not one of those sunny days with lovely palm trees like all the travel brochures depict. It felt like a war zone, and we hurried along to the shelter of the car. It had been another long day. Coming from Oregon, we were hoping to bask in some much-needed sunshine, but instead it felt like the rain and cold followed us across the ocean. Not to worry, though, because at least we were prepared for it. Our tropical vacation was chock full of unexpected surprises and it would continue to offer interesting twists and turns as we worked our way across Maui. This entry was posted in General, Hawaii, Hiking on July 20, 2016 by Jess B. Road tripping Maui: Discover wild tropical flowers, hike through a bamboo forest, walk on a black sand beach, and the highlight of the trip! We got up at o-dark-thirty to begin the very popular drive to Hana. The plan was to drive out to the far side of Haleakala National Park to hike the bamboo forest, making a few detours along the way. Our trusty guidebook was very frank about which attractions were worth stopping at and which were not, so we bookmarked a few key points of interest and hit the road. First stop: Haipua’ena Falls. A brief walk up a dirt path led through the thick, tropical vegetation to this pretty little waterfall. It was a nice Hawaiian sampler: colorful flowers, lush greenery, interesting mushrooms and a picturesque cascade pouring into a pool. With a lot of ground to cover, we kept our eyes on Hana while making just a few more stops along the way. One noteworthy stop was at Wai’anapanapa Park, a beautiful place with a crazy name. There was a lot to explore, including lava caves, a black sand beach, and shoreline trails. It was impossibly sunny and bright. The ocean sparkled as the water swelled towards the rocky shore. We walked along a short hiking trail past some caves, then meandered towards the black sand beach. Several people were out sunning themselves on the dark sand. The black lava rock created sharp, statue-like formations along the edge of the surf. Every angle looked just like a postcard: palm trees framed lovely ocean views in the intense light. Back on the road, there were more and more roadside stands selling fruit, flowers, banana bread and trinkets. We cruised past Hana, where suddenly there was traffic congestion and people everywhere. The next stop was the Kipahulu entrance to Haleakala National Park. We were really excited to see these pools. Based on the description and photos in the guidebook, this was a serious must-do stop. But here it was overcast, gray, gloomy. And the path to the pools was closed due to dangerous surf conditions. So we couldn’t get very close and the view we got wasn’t very spectacular. Disappointed, we found a little nook tucked under a pandanus tree to sit and eat our sack lunch. Despite the mob of tourists visiting the site, no one walked by our sweet little lunch spot. 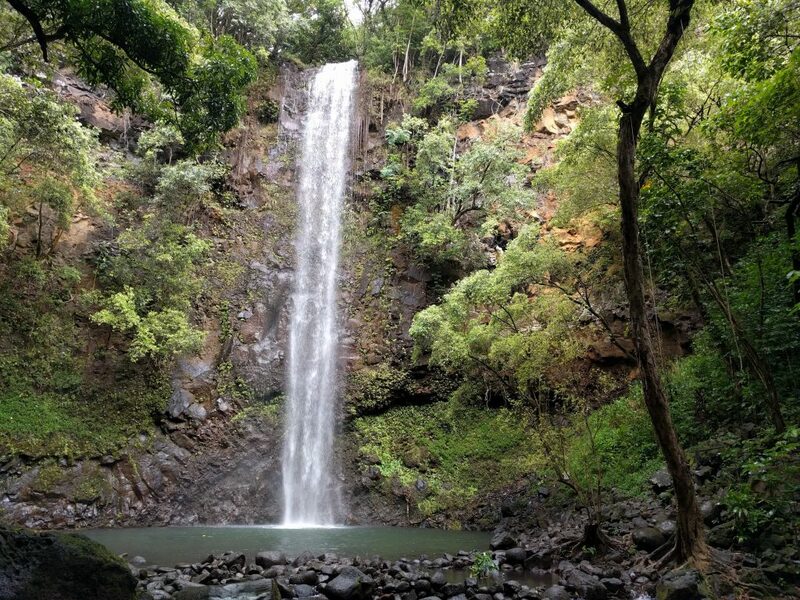 But the main attraction at this site was a 2 mile hiking trail to Waimoku Falls. The secret was clearly out; the trail was wall-to-wall packed with people. We pushed our way up the trail. The crowds died back a little the further we got from the parking lot, but not by much. We passed a few smaller waterfalls on the way to the big one. But the highlight of the walk was the bamboo forest. The thin bamboo stalks seemed to go on forever. At times the dirt path gave way to boardwalks. The whole place felt like it was manufactured, like we were walking through a cartoon. Only once before had I walked through a bamboo forest, many years ago in Thailand, and I remember it feeling equally strange and magical. At the end of the trail there was a tall, skinny waterfall that felt like it had been transported from Oregon. People were whooping and hollering loudly from below the falls. Their voices echoed across the basin so although we couldn’t see anyone through the foliage, we sure could hear them. Other people stood at the viewpoint, getting into every photo. It was anti-climactic. One of those hikes that was worth doing once, but the whole time I kind of wished I wasn’t there. We returned quickly, and about 2 minutes from the car the sky tore open. A quick but dramatic deluge of rain poured down on us. We praised our good timing and began the drive back into town. Along the way, Aaron stopped to pick up a hitchhiker (because I guess you do stuff like that). She was a tiny whisper of a person, a young, free-spirited, eco-traveling, hippy-type who needed to get into town for a yoga class or something. She was perfectly harmless and grateful for the ride. After Hana we finally made a stop to buy banana bread and eat homemade ice cream. So yummy. Then we had the long and lazy drive back along the road, which was now packed with other drivers. The road was in remarkably good condition, it was just really narrow and treacherous in spots. It was one of the most scenic drives I’d ever done. The tropical plant life extends right to the car window as there was no shoulder on the road and only occasional pullouts. Cliffs on one side, trees and waterfalls on the other, there were no lack of sights to see while driving. It was important to be vigilant about other drivers, however, who seemed to have no ability to pay attention to the road or be smart about where it was okay to pull off the road. Near some popular waterfalls we had to wait as people were just randomly milling around in the middle of the road, with cars trying to get through in either direction. It was a great way to spend the day, but we were ready for some more active adventures in the days ahead. There were several stops I neglected to mention. I feel really strongly that we’re living in a time where too much information is at your fingertips. Every place has been written about, photographed, geo-tagged, and marked. There’s not much mystery in the world. But one of my favorite things about traveling is the sense of discovering a secret place for the first time. While none of the best spots we found were any secret, they were sort of happened-upon discoveries that weren’t on our pre-planned agenda. At one of these special places of discovery, Aaron asked me to marry him. I’ll never forget this moment, or this spot, and the story is ours to keep forever. It was the perfect time and place, and we had it all to ourselves. No crowds. No food stands. No traffic. No tourist attraction signs. The best adventures are the unexpected ones that come about by just being in the moment. 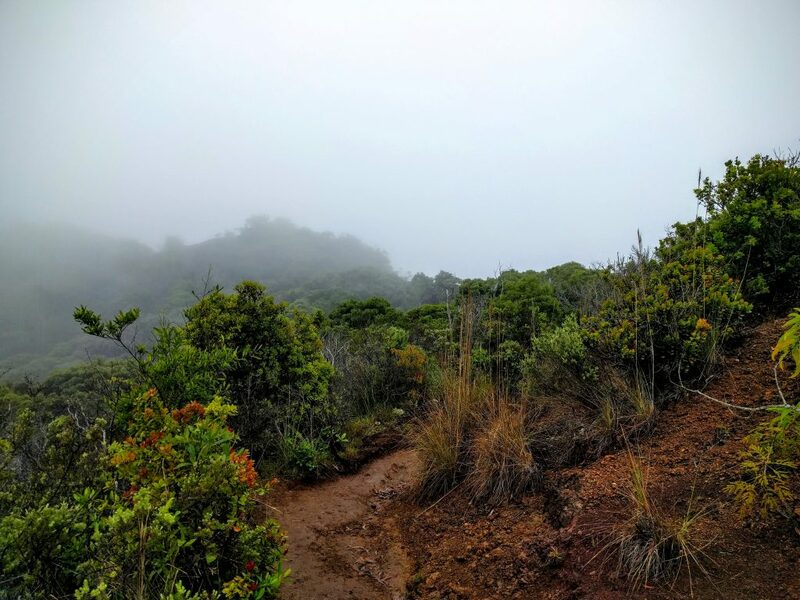 This entry was posted in General, Hawaii, Hiking on July 10, 2016 by Jess B. Get an early start and the island is your playground. 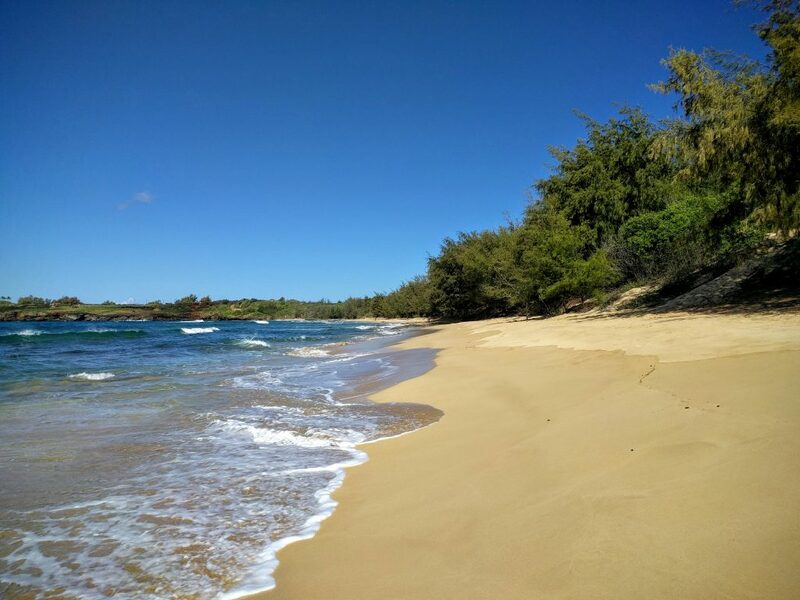 On Maui’s South Shore, climb a big red hill and relax on Big Beach with a capital B. We woke up early so Aaron could meet his SCUBA boat at the dock by 5:30 am. The island was on fire. Or so, that’s what it looked like as we drove down from Kula towards Kahului on our way to the dock. A bright red-orange glow stretched out on the horizon below us. As Aaron drove I scoured the Internet, looking for breaking news. Nothing. Maybe our eyes were sleepy, or there was some local phenomenon that just made it look like we were driving into a massive brush fire. The closer we got to it, the less dramatic it appeared. We’d later learn that the sugar cane fields are burned right before harvest. Didn’t read that in the guidebook. Aaron got on the boat and I was left alone in the dark on the island, so…what’s a girl to do? I kept driving south to Makena State Park. The gate was locked but there was plenty of on-street parking so I locked up the car and walked along the short road into the park. One of the old guidebooks in the Corvallis Public Library mentioned a hike up a red hill inside the park. It was not a huge climb but it was a prominent feature and it intrigued me. I walked across the sand on a deserted beach that appeared to dead end into a rock face. Huh? And when I reached the wall, the opening made itself obvious. It was a brief scramble up a rock ramp to the base of the hill. I’d read online that the trail had been closed due to a rock slide. A sign was posted there to prevent people from going further. But it was apparent where the ground had slid and it was easy enough to avoid the sketchy stuff. I skirted around the base of the cinder just enough to pick up a network of steep use trails that climbed up towards the top. The scratchy vegetation that made its home on that hill was just thick enough to be difficult to avoid. I guess this wasn’t the best day for shorts. When I reached the top of the hill I realized I was on the rim of a small crater, not at a clear summit. I traced the edge of the crater in search of the best viewpoint. The sun had not yet crested over the mountains to the east, so I sat in wait for better sunlight. From my perch I could see Kaho’olawe, an uninhabited desert island and the smallest of the Hawaiian islands. I admired the beautiful, yet thorny, lantana flowers, blissfully unaware of its epic weed status at that point. After circling around the crater I descended back down the scree and took a short detour across a rock outcrop protruding into the ocean. I passed by some dazed-looking campers (squatters?) and walked down to a stretch of tidepools at the water’s edge. I wasn’t alone out there, someone was smoking and listening to music on his phone speaker, so I took a quick look around and busted out of there. It’s nice to finish a hike with a walk on the beach. By now, a few walkers, runners and swimmers were around but it still felt quiet and peaceful. I took my shoes off, walked barefoot across the sand and listened to the waves crashing into the shore. A stand of trees at the opposite end of the beach provided some welcome shade. I relaxed there to kill some time before picking Aaron back up from the dock. Later in the day we’d do Hawaii right. We had our first shave ice (but not last!) of the trip, went snorkeling, and had a picnic on the beach. I’m pretty sure we saw a hawksbill sea turtle at Makena Beach. It didn’t look like all the green sea turtles I’d remembered from college a billion years ago. The design on the shell was much more complex and geometric. We learned about the afternoon wind on the South shore. It was kind of nuts. The water got so choppy while snorkeling that we had to get out, then it was nearly impossible to enjoy a quiet lunch in the grass. It felt like we were eating in a hurricane. Yet another reason to get an early start! We packed up and visited the Alexander and Baldwin Sugar Museum on our way home. The best part was actually outside the museum, where they had some old trucks and machinery plus a ton of cool trees. Aaron foraged some nice looking mangoes from the ground to bring back to the house. I finish here not with a random pictures of baby goats, but a purposeful picture of baby goats. We swung into the Surfing Goat Dairy Farm hoping to take a tour, but the last one had just left. Our consolation prize was getting to gawk at the babies playing in their little pen near the gift shop. 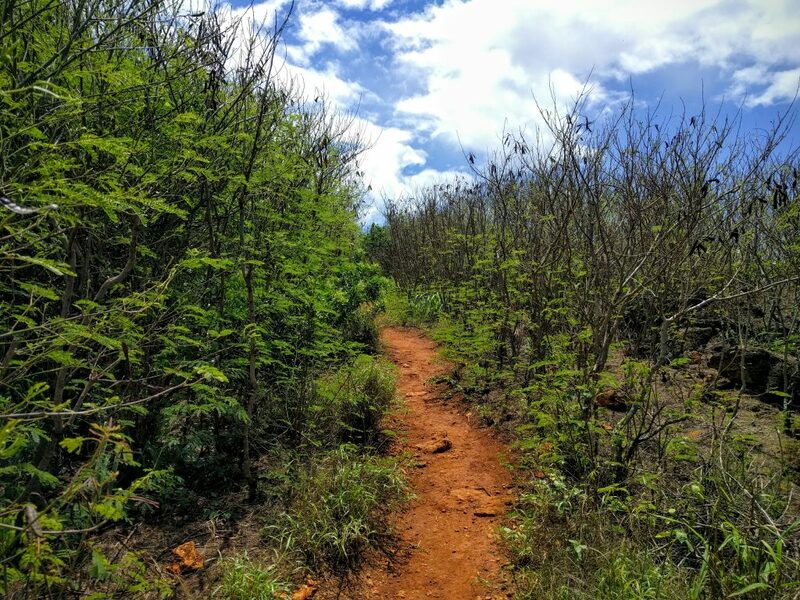 This entry was posted in General, Hawaii, Hiking on June 27, 2016 by Jess B.